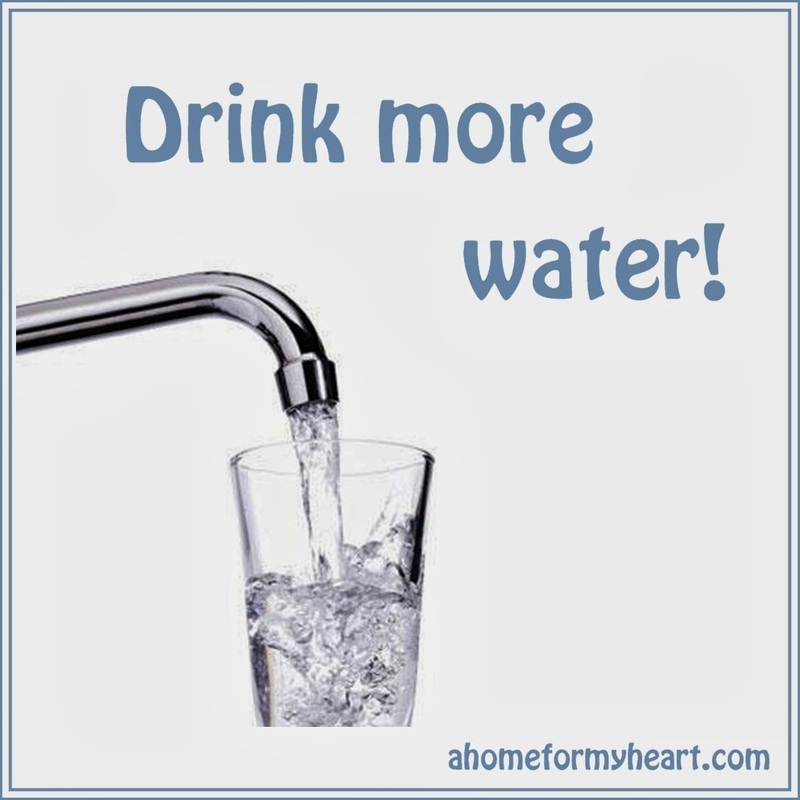 a home for my heart: Drink more water! I stopped using my Drink More Water app some time ago and got out of the habit of drinking enough water. A few weeks ago I discovered that ALL of us were dehydrated. From a lower milk supply (me), to headaches (Lost Boy), cracked lips (2Flowers), ammonia scented diapers (Oreo), Lost Boy and I realized that we needed to get on top of hydrating our family! I've been keeping a pitcher of water on the dining table and forcing myself to gulp down a whole 12 ounce cup of water every few hours. I can already tell the difference for me - nursing sessions result in Oreo getting fire-hosed. And that means he is getting more liquid in him. Though I have also been letting him have a sippy cup at dinner too (it keeps him busy!). Lost Boy takes care of himself most of the time. Sometimes I fill a 16 ounce cup and put it near him, or check in and ask if he is drinking enough water. 2Flowers is harder. I don't know how much she is drinking. She isn't eating Otter Pops very much anymore because it isn't hot (I justified letting her have several a day by figuring she was getting water into her). She has been asking for juice lately, and we dilute our juice with water (about 50/50) so I know she is getting some water. But while juice is good, it isn't the best option for a long term strategy. I think what I need to do is leave a little pitcher of water and a cup on her Activity Table. Maybe then I could tell how much she was drinking each day? How do you keep your toddler or preschooler hydrated during the cooler months? My kids each have a camel bak water bottle they use. I refill it every morning, so it's easy to see how much water they've consumed at any point during the day. We don't give juice, only water and occasionally almond milk for Kaelyn (which is mostly water). They are both good water drinkers. Better than me most days.